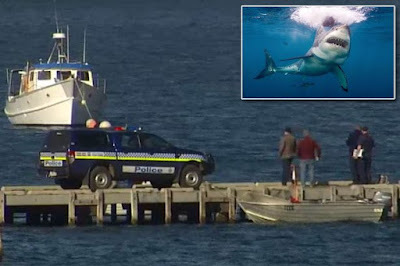 A large shark attacked and killed a man who was diving with his daughter off the coast of Maria Island in Tasmania, Australia. The man, who was in his late 40s and his daughter, who is in her 20s, were diving for scallops from a small dinghy Saturday morning when the fatal attack took place, the Australian Broadcasting Corporation reported. 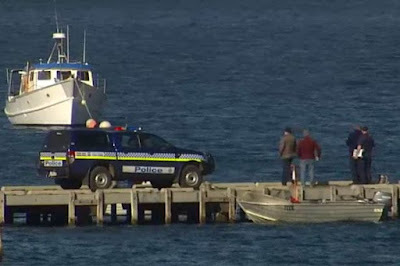 The woman had returned to the boat while her father continued to collect scallops underwater, David Wiss, an inspector with the Tasmania police, told reporters during a press conference. "His daughter became worried and went down and checked on her father when]she saw a very large shark, she saw her father being attacked by the shark," Wiss said. The woman resurfaced from an estimated depth of 39 feet and set off a flare to alert other boaters in the area, who came to help. "They pulled up the man using the air hose that he was attached to," Wiss told reporters, "but unfortunately he was fatally injured." The victim's daughter was "deeply traumatized," according to Wiss, and could only describe the shark as "large." Witnesses reported sightings of a 15-foot great white shark in the area on Friday, a Maria Island senior ranger told The Examiner. Sharks are not common in those waters, said John Hammond, president of the Scallop Fishermen's Association of Tasmania, which regulates scallop fishing in the area. Other divers were also in the water at the time of the attack, he said. "It is really shallow, sheltered water," Hammond. "It used to be traditional scallop ground... It is an absolute tragedy." Tasmanian senator Peter Whish-Wilson said that the event was a "terrible tragedy," but asked the public to stay calm.